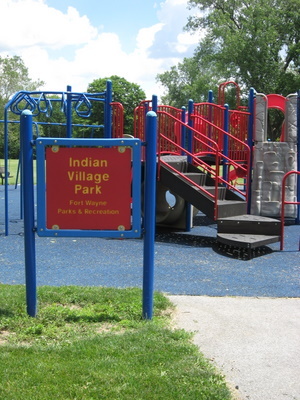 Indian Village Park is located at 1701 Bluffton Road. For more detailed location information, check out the General Park Map or the Park Map. The riverbank and park strip tracts were transferred to the city in 1926. In 1929 the Board built a footbridge between Foster Park and land to be known as Indian Village Park. Sears Roebuck and Company offered to build the pavilion that is located in Indian Village Park for the city in the early 1940's with the understanding that the city would assume control and maintenance of the building after construction. Today that pavilion is known as Sears Pavilion. For a period of time, part of the pavilion was rented as an apartment. Also interesting to note is the existence of a Tourist Camp. During the 1920's a City Tourist Camp was established along Bluffton Road in the park. The Tourist Camp is what we now know as a campground. The Tourist Camp started out as free to automobile owners then was raised to $.25 and then $.50/per day per automobile. There were some amenities available to those staying at the camp including a Community House, water, cooking facilities, wood enough to cook meals (but no wood allowed for any bonfires), toilet facilities and a place to hose and wash your automobile! 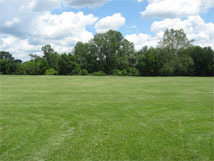 The natural space at Indian Village Park provides plenty of opportunity for you to enjoy your favorite summer activities, whether it's playing frisbee or flying a kite. 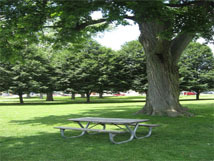 Several picnic tables are scattered throughout the park under shaded areas for you to enjoy. 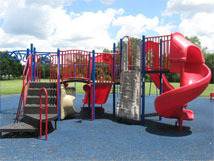 The playground at Indian Village Park includes a swing set, a rock climbing area and 3 slides that are fun for any child. 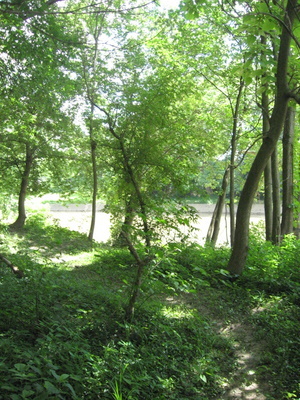 Indian Village Park is just one stop on the 24-mile Rivergreenway trail. Enjoy a brisk bike ride, walk or jog on the Rivergreenway and stop by the park. 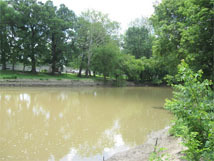 Then when you are ready, continue your journey by accessing the bridge to cross into adjoining Foster Park. Sears Pavilion, Indian Village Park's very own pavilion, is available to rent for your next birthday party, meeting, reunion, you name it! 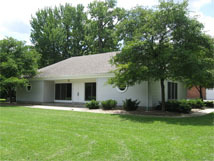 For more information, check out the Pavilion page.